The stalking hunting area is located in the National Park of La Sierra de Cazorla (Jaén). This is the Spain’s largest protected area covering 209.920 hectares land. Very famous for its hunting tradition, in 1.960 it was designated Cazorla-Segura National Hunting Reserve. In these mountains you can find a variety of species as redstag, mouflon, fallowdeer, southeastern ibex (Sierra Nevada ibex) and wildboar. This is a great hunting experience that starts with the arrival of the hunters to the international airport of Málaga. After colleting the weapons, also possible to rent riffle by us, we will drive to the Hotel Spa Rural Coto del Valle, www.cotodelvalle.com, about 2h30min from the airport. This hotel is located in the heart of Cazorla National Park, the hunting area where we will enjoy during the following days of this amazing stalking hunt. The hotel is surrounded by a landscape of outstanding natural beauty. Exhibiting architecture that is both well-maintained and respectful or the surrounding environment, here you will feel proximity to nature, without compromising on comfort. This hunt, just like other stalking of this species, begins in the early hours of the morning. It is a mountain hunt in which the hunter and guides search, with the aid of binoculars and monocular- for a suitable trophy according to the clients de- mands. The stalking should then be carried out in complete silence, with attention being paid to the recommendations of the guide, who will demonstrate his knowledge and know-how in the terrain. 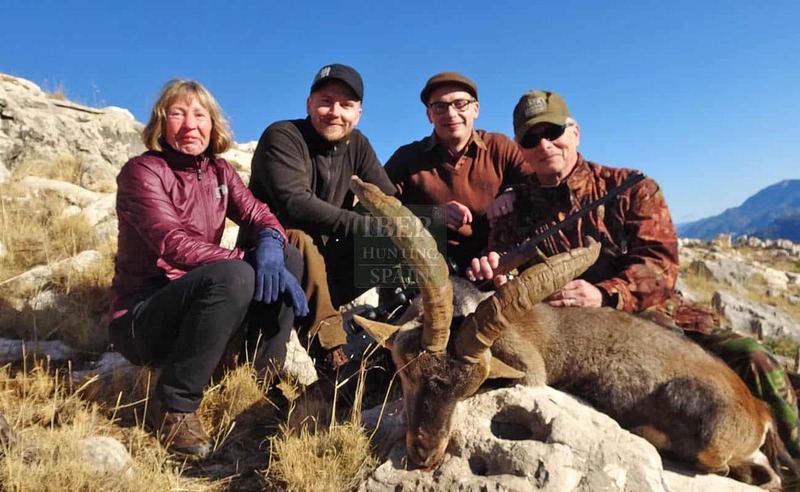 In this National Park you will live amazing hunting days watching all kind of animals like red-deer, fallow-deer, mouflon, wildboar, ibex… All hunters who was in this hunting area are still dreaming of this hunt rich on all kind of animals dur- ing all day. Shooting distances may be in the range of 150 – 250 meters. Recommended calibres for this hunt are 300 WM, 338 WM and 270 Watherby. In most cases you will have time to get a confortable rest for shooting, but sometimes you must be able to mana- ge quicker shots. The Natural Park is very big so we can receive groups from four to ten hunters. We organise trips with four hunting days and five nights fullboard accommodation. Groups with 6 hunters can be guided 1×1. From 6 hunters to 10 hunters, they can be guided 2×1. This hunting program includes a Representative Sierra Nevada Ibex, a female Ibex, a selective mouflon and a female. In good weather conditions, all our hunters get to complete this quota even to shoot some more animals. We remember you that this Natural Park is plenty of different game which makes this trip a really unforgettable experience. A lot of our customers repeat everyday year with group of friends or in family for hunting in this area where it is posible to organise personalized hunting programs with different quota of game. It is also possible to take with you the meat of the shooted animals. We can organise it with a butcher and a veterinarian that certifies that you can take the meat with you. Hunting in the Natural Parks is based in a strict licence system. In the Natural Park of Cazorla we need to buy licences for your hunt prior your arrival. Animals that need to order licences before the hunting date are: Sierra Nevada Ibex and female, independly of the size of the trophy and trophy medal of redstag, fallowdeer and mouflon. To confirm your booking we require a deposit of 50% of the cost for the hunt. The remaining balance to the full cost of your hunt has to be paid not later than 60 days before the hunting date. In case to shoot a bigger trophy the extra points would be paid after the hunt by signing of the hunting protocol before your departure. Any reservation made less than sixty days before de hunting date will be confirmed by the full payment of the hunt. The measure of the trophies will be done “en verde” (in green) in the field by the rangers of the Natural Park. In case of cancellation with more than 180 days before the hunting date, the deposit will be refunded less 10% and five hundred euros as administration fees. In case of cancellation between 180 and 61 days before the hunting date, the total deposit is forfeited. In case of cancellation of 60 or less days before the hunting date, all booked services must be paid.